Whilst few would argue that this is amongst the most beautiful royal houses of Europe, it can certainly hold its own in terms of romance. For this sprawling edifice is very much the Camelot of Poland - a mythical place that is cherished by Cracovians and Poles alike. The royal castle has had a decidedly bumpy history, knowing periods of both great splendour and great humiliation. Once the nerve-centre of one of the largest and most powerful countries in Europe, it later became the barracks of what was little more than a grubby outpost of the Austro-Hungarian Empire. The last war too saw fresh trials, and it was here that the Nazi Governor, Hans Frank, made his home. The golden age of Wawel took root many centuries before this. Things began to get into gear in 1138, when Krakow became the main royal seat. However, it was during the reign of Kazimierz the Great (1333-70) that the castle was truly born. A fire in 1499 destroyed much of this, yet also paved the way for Cracow's first taste of the Renaissance. It was then that the stunning courtyard was built, a design that started a long-lasting fashion in Poland. Today, on the crest of far-reaching restoration, the castle is in its best shape for years. Inside, the State Rooms are an obvious starting point, whilst the Treasury and Armoury are also well worth a look. The Lost Wawel exhibition, which can be found in the cellars of the west wing, is a remarkable piece of work. It draws back the curtain on Cracow's earliest days. The State Rooms are the main focus of the castle interiors. It is hard to imagine that for well over a hundred years these apartments served no more than a sober, military purpose. For during the nineteenth century the Austrians used the entire castle as a barracks. Thus it was not until 1905 that restoration began, which was itself hindered by the looting and pandemonium of the Second World War. Today, however, you would hardly know the difference. The magnificent tapestries of Zygmunt the Old have returned, and there is a rich array of furnishings, much of them from ancient Polish collections. The only presence that is lacking is those rumbustious, mustachioed grandees, replete with their fur capes and silk belts. But it is said that even they emerge when night has fallen. Just as well-to-do fellows of today might indulge in a snazzy car or watch, it would seem that nothing more pleased the Ancient Regime nobleman than the possession of swords, maces and general fighting paraphernalia. And for the Poles, the more oriental or jewel-encrusted (and preferably both) the better. Some of the weapons in this armoury are so exquisitely fashioned that they might even inspire a pacifist to indulge in a little sword-play. Alongside these treasures there are also a number of ceremonial objects, many of which hail back to ancient times. The crown jewels are famously absent, having been melted down by the Prussians after the final dismemberment of Poland in 1795. However, the mythic Szczerbiec Sword, which was used during coronations from the 13th century onwards, is still to be found. It is difficult to imagine Cracow as it was one thousand years ago. 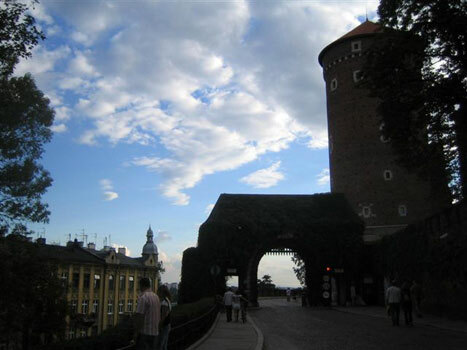 In those times the city's heart lay at Wawel, where there was a small fortified settlement. Below, a number of wooden houses had sprung up, and these were protected by a wall. The town was just beginning to make its name as a trading centre. Beyond Wawel, the countryside stretched unbroken for miles. With the river curling around on all sides and the curves of the valley rising up in the distance, it was an idyllic place to found either a church or a castle. As the city grew in importance, new elements were added and older ones began to be obscured. At times, whole wings of the castle were rebuilt from scratch. This really gained momentum when Cracow became the main royal seat in 1138. Yet whilst many elements were seemingly lost, traces of the ancient Wawel survived. This exhibition seeks to pour light onto that epoch. Inside this intriguing museum there is a fine model of Wawel as it was before the Austrians moved in in 1795. The fruits of decades of archaeological work on the hill are also displayed. And there in the cellars of the east wing lies a small rotunda of the Virgin Mary. Partially reconstructed after its rediscovery a hundred years ago, it is the best preserved pre-Romanesque church in Poland - a treasure from the dawn of Christianity in Poland, which came a full millennium ago. After storming the castle and admiring its treasures, you might want to make your way to the splendour of the Wawel Cathedral. Super video! I want a dragon like that! I am native here...Just want to add ... It must be open 7 day a week, come on, you've got people coming over from all over the world, you can't disappoint them. Goog page, well written, witty English. Beautiful, BUT too bad the Museum is closed on mondays...to come all the way from Canada and find it closed, broke my heart...Come on Wawel...keep it ope 7 days a week and help the unemployment rate!!! This is a good page, just include a little more info on how many stories and how big it is in all. I am going to there tomorrow. For the first time! I am sure, I will like it! Krakow beautiful. Like the story about the dragon underneath castle! Fantastic place, wonderful people. I highly recommend you to visit Poland, especially Gdansk and Krakow. the city to fall in love with.Timeless beauty and ambience. Cannot be in Poland and not go to Krakow. Gotta love the Wawel Castle in Krakow. It's not a castle in the English sense, with lots of battlements and drawbridges, but rather the sacred hill upon which much of Poland's early history is based.. The architecture is mixed but the courtyard is amazing as is the cathedral and you can enjoy great views out over the Wisla. It's just a nice place to wonder up to on a lazy afternoon... and free admission!